The last authorized Hoyle, the "sixteenth" edition of 1775, had many competitors as the work had entered the public domain in 1774. The authorized edition was published by a consortium headed up by Rivington, Wilkie, Crowder and Baldwin and despite losing their copyright protection, they were certainly the most aggressive in creating new editions of interest. 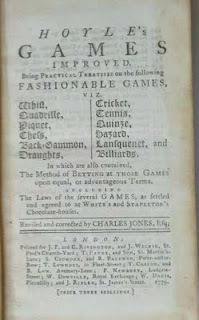 They hired Charles Jones to edit Hoyle's Games Improved and brought out an edition in 1775 to compete both with their own book and with other "improved" editions. But I would argue that their second edition of 1779 is the most important edition of Hoyle published after his death in 1769. There is a hint of the publishers' strategy in the 1775 edition. 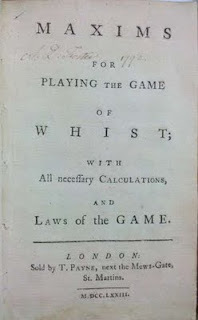 The book expanded the section on whist to include the text of another work, Maxims for Playing the Game of Whist, London 1773. Maxims, by William Payne, was the second book in English on the game of whist after Hoyle. It sold well with two more editions appearing in 1778 even though it also appeared within the 1775 Hoyle's Games Improved. Mr. Ridley was the last-listed publisher in the consortium and was contributing his rights to the cricket laws which had been printed separately in 1775. That strategy of incorporating separately printed gaming works into Hoyle's Games Improved continued in 1779 with the inclusion of several important works. The first example is an entirely new and greatly expanded section on billiards. 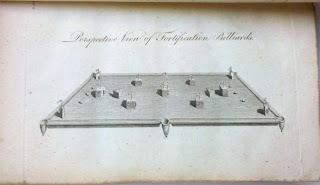 "Marker" John Dew wrote a treatise on the game of billiards which he sold to a member of the consortium for four guineas in August, 1776 (British Library Add. 38728 f.55). 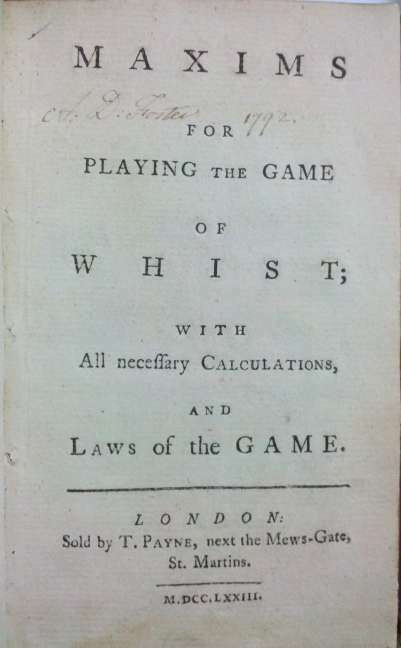 The book was was not published until 1779, when the consortium issued it both separately and as part of Hoyle's Games Improved. An engraved plate with two views of the fortification billiards table appeared in both books. Lowndes was another member of the publishing consortium. This day was published, a new edition, in 12mo, price 3s. only, Hoyles Games Improved: Being practical treatises on the following fashionable amusements, viz. Whist; Quadrille; Piquet; Chess; Back Gammon; *Drafts, by Mr. Payne, with the figure of a Draft Table; *Cricket, as now played by the nobility and gentry; *Tennis; *Quinze; *Mr. Payne's Maxims of Whist; *Hazard; *Lansquenet; *Billiards, by Mr. Dew, with plates...Notes are given to illustrate the games by Hoyle; and those marked * are additional improvements. Revised and corrected by Charles Jones, Esq...N. B. Mr. Dew's Treatise on Billiards may be had separate, price 1s. sewed. The advertisement highlights the new authors and the inclusion of engravings. 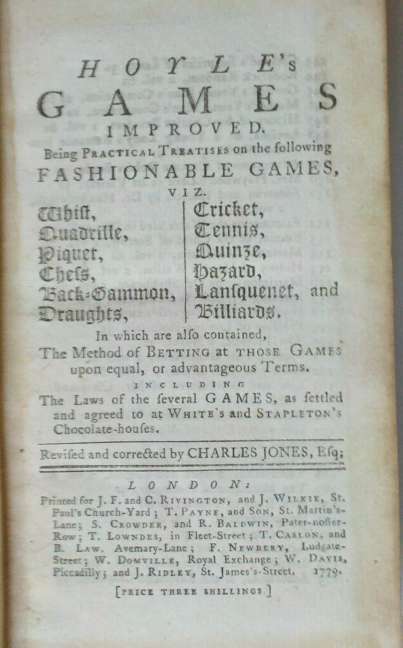 In 1774-5 when the Hoyle copyright expired, it was unclear whether Beaufort, Charles Jones or the Annals of Gaming would become the market leader. With the addition of popular works by John Dew and William Payne in 1779, Rivington and partners won the marketing battle, as is evident by that fact that their Hoyle's Games Improved remained in print for more than 50 years until 1826. That is why I claim the 1779 Charles Jones edition as the most important Hoyle after Hoyle. J. D. Fleeman. A Bibliography of the Works of Samuel Johnson. Treating his published works from the beginnings to 1984. (Oxford: Clarendon Press. 2000).